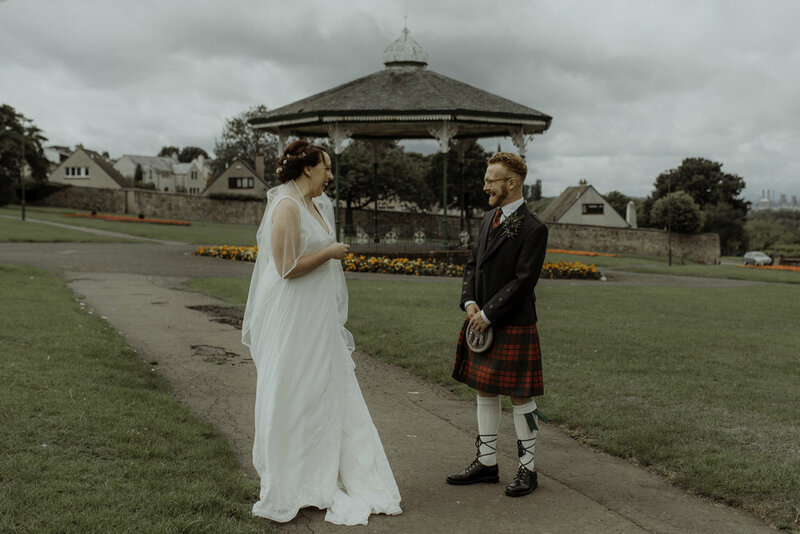 Abi and Ross met during college when Abi was doing a semester abroad at the University of Stirling in the small, picturesque city of Stirling, Scotland. 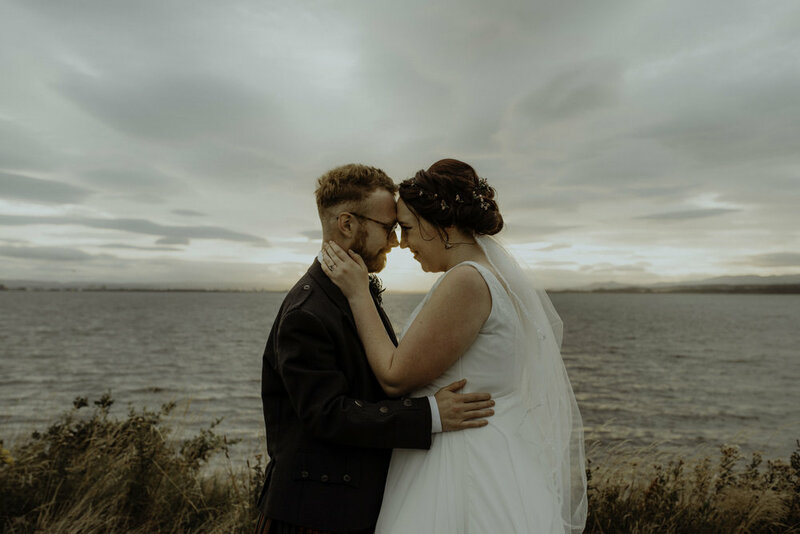 They first clapped eyes on each other in the dining hall, where Ross quickly convinced Abi to join the Sitrling University Drama Society (SUDS for short). Abi fell for the funny, charismatic redhead quickly after seeing him perform and she tried a few subtle flirtations to win his favor, but Ross remained blissfully oblivious to these advances until Abi teasingly stuck her icy, cold hands down the collar of his shirt. Somehow that did the trick and Abi’s cold hands warmed Ross’s big heart. After that, things happened quickly. “On Monday we were just two people and by Friday I was calling the admissions office and arranging an extension of my semester abroad,” said Abi. 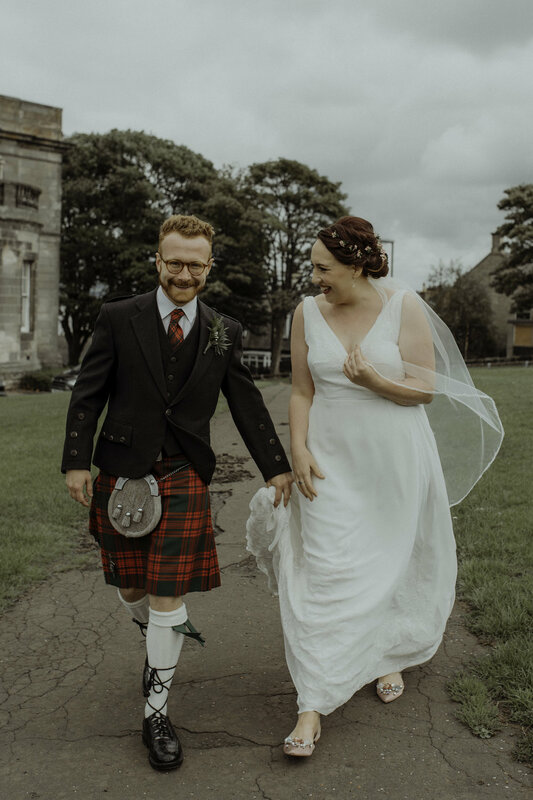 One semester in Stirling turned into a year and then a masters program, but eventually Abi’s student visa ended and she had to return to the United States. However, the couple kept their long distance love alive for two years and visited each other as much as they could. On a visit back to Scotland, Ross took Abi to the Falkirk Kelpies, an art installation of two 100 foot tall horse heads, where he was working as a tour guide, for a personal tour. He walked Abi through the park before bringing her inside one of the horse heads. Pointing at a steel panel, he described how the flaws in the building of the Kelpies were few, only this screw and one other were misplaced, and yet were integral to its perfection. When Abi turned her head to look back at him, he was on one knee. Abi said “yes!” and in true Abi and Ross fashion they went to McDonald’s for breakfast and took a nap to celebrate. 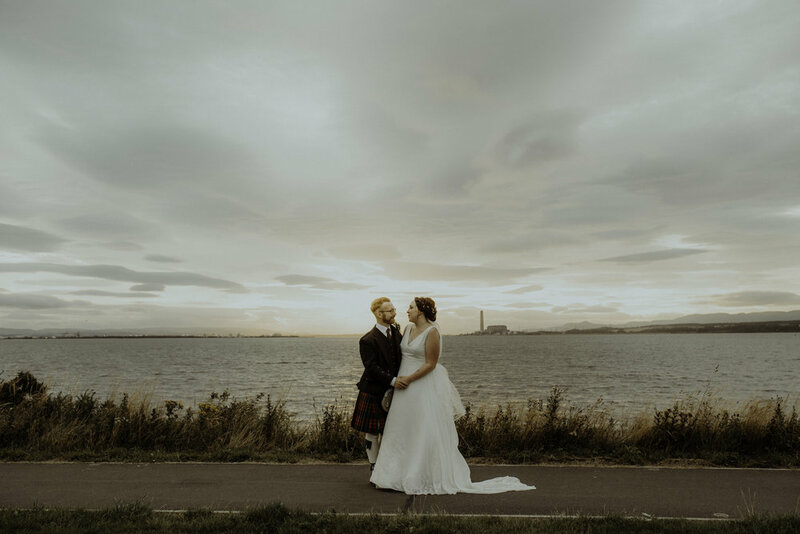 When it came to planning the wedding, the couple did have some logistical challenges since Abi was still living in the United States and Ross in Scotland and it is a struggle to plan any event from overseas, let alone a wedding. 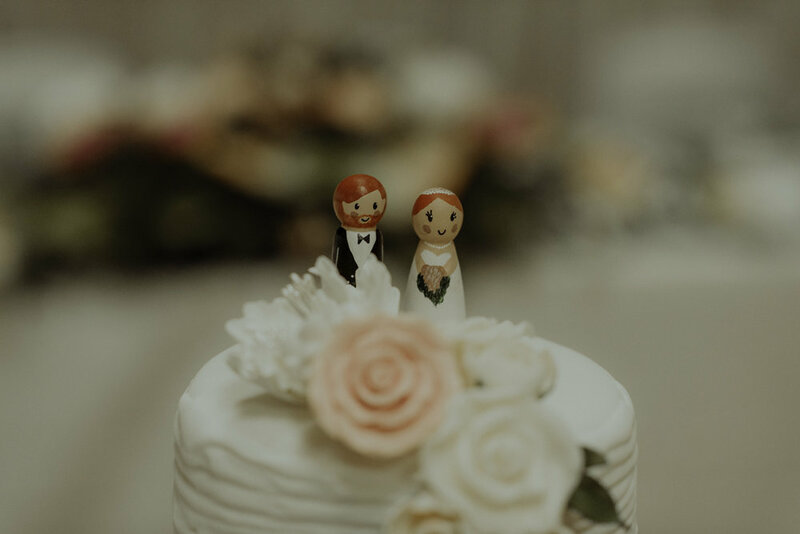 However, thanks to the magic of video chat and good ol’ open and honest communication they were still able to plan their dream wedding together. 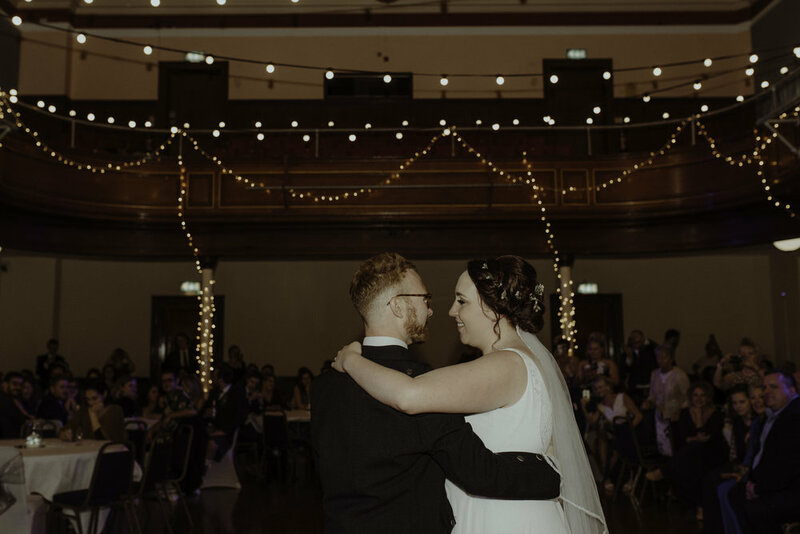 On August 4th, 2018, Abi and Ross united their lives and celebrated their new marriage in front of 170 friends and family. 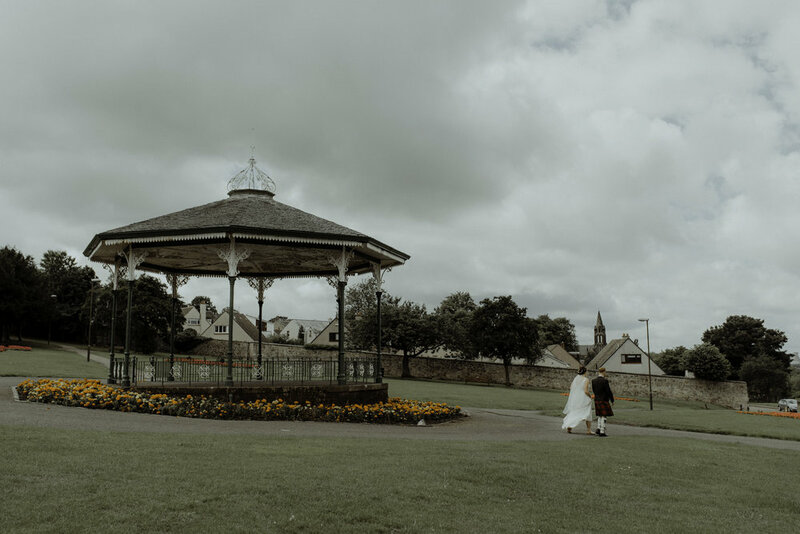 For their venue, they picked the Bo’ness Town Hall, in Bo’ness, Scotland, which is located conveniently between Ross’s family home and the couple’s new flat in Glasgow. 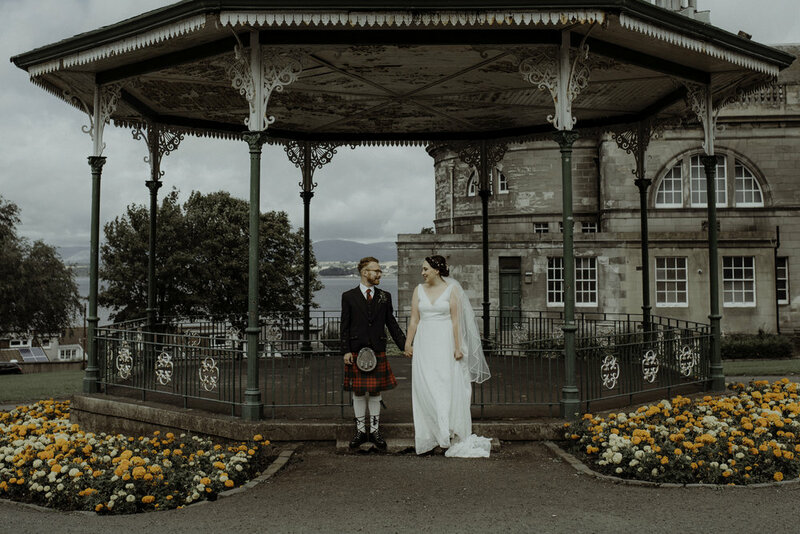 The location, romantic charm, and the relatively low rental price (£1,000, which is about $1,300 US for the whole weekend) sold the place for this couple. The building is a former Carnegie library and much of the old architecture remains. 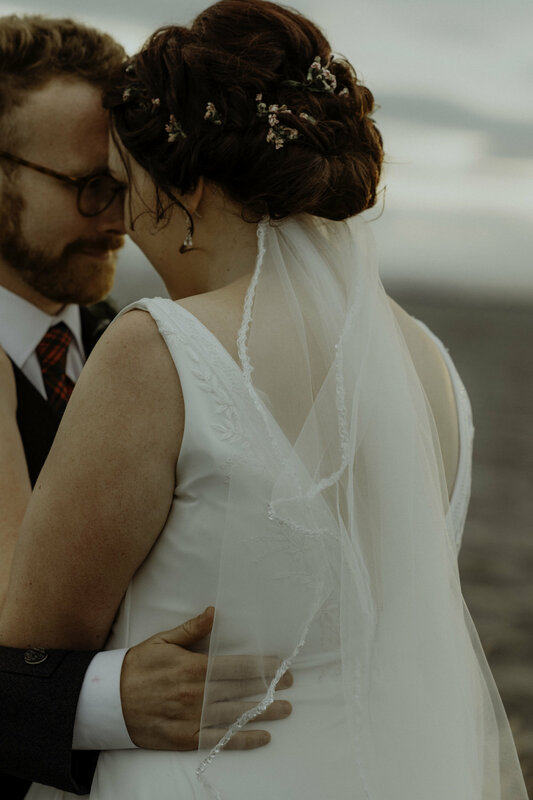 When they started planning, Abi and Ross wrote down three key words that they wanted to keep in mind for all of their wedding decisions: romantic, personal, and chill. This helped center them because all of their decisions related back to one of these key points: from ceremony, to decor, to outfit choices. Abi knew right away that she wanted blush florals and very simple centerpieces for a soft garden feel, but the theme was a little harder to narrow down. Abi and Ross both have a real affinity for kitsch, so they considered playing with a super specific theme. 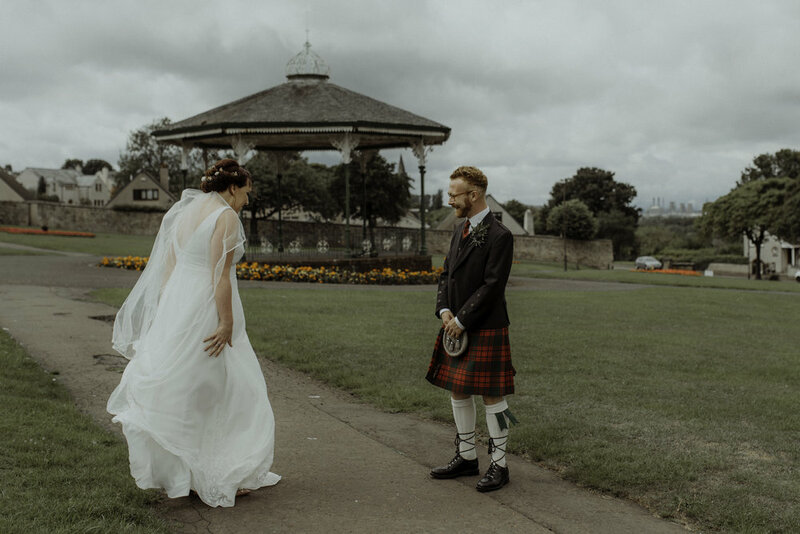 Personal touches were important to Abi and Ross, especially in their Humanist ceremony. 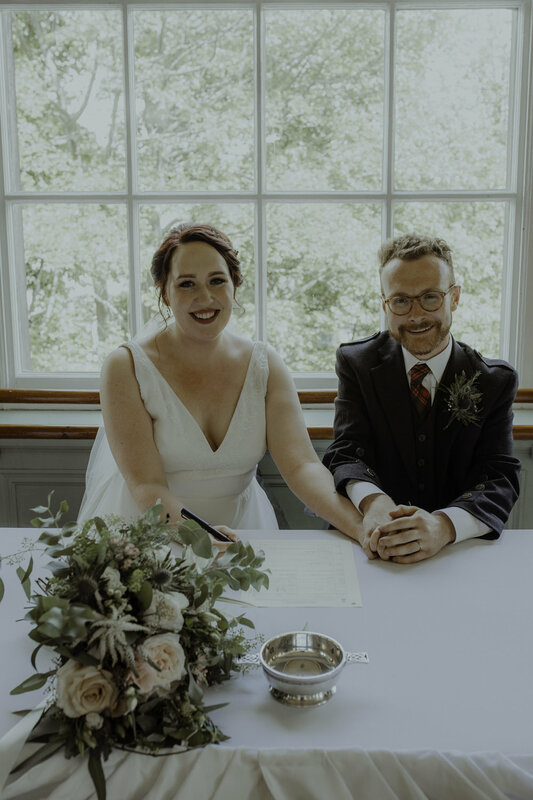 Abi and Ross chose to have a Humanist ceremony because they were able to write and curate exactly what they wanted and it was a perfect expression of their love for each other. 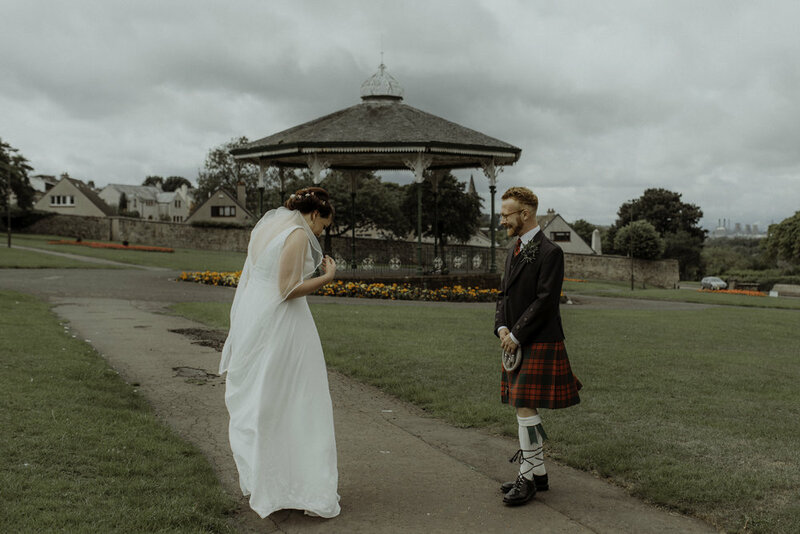 As part of their vows, the couple participated in a Quaich ceremony. A quaich, sometimes called a love cup, is a traditional Scottish two-handled cup. 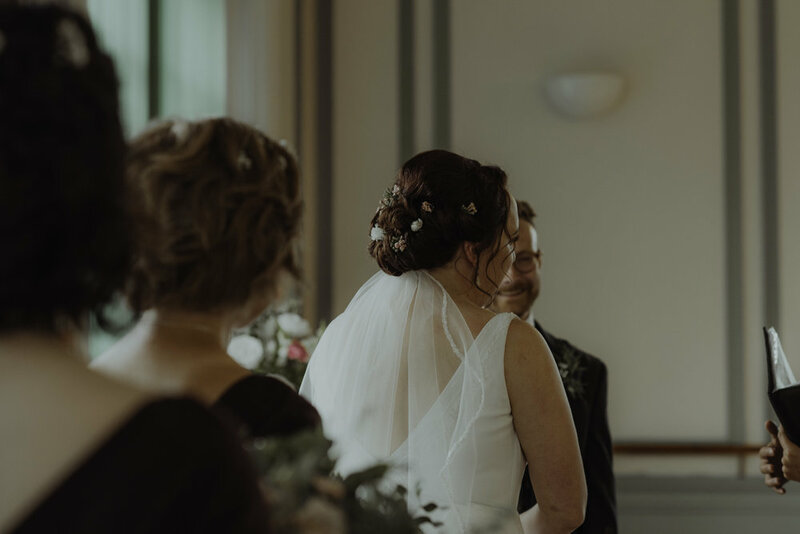 During wedding ceremonies, the couple traditionally each takes a handle to drink, showing that you trust one another to share the cup. 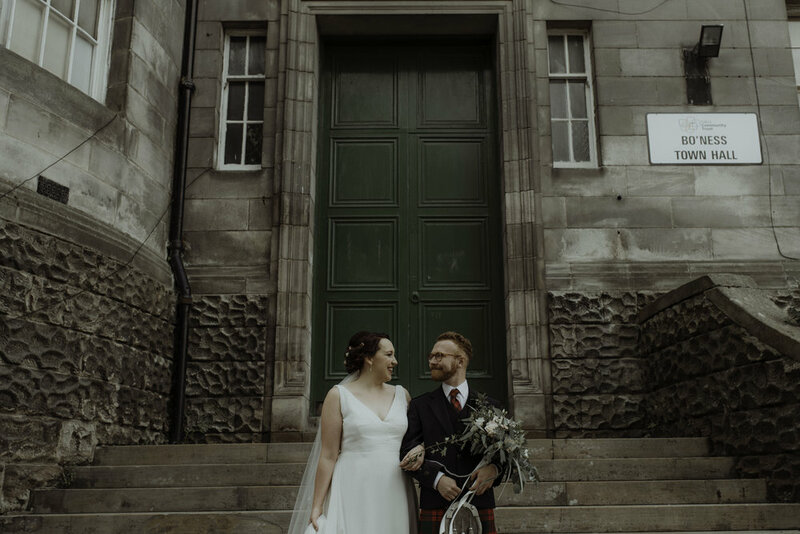 The quaich that Abi and Ross used was a gift from Ross's aunt and uncle and the whisky that they drank was a gift from another aunt and late uncle, who purchased the bottle to celebrate Ross’s birth. After Ross’s uncle passed, his aunt presented it to him as a gift on his 21st birthday. 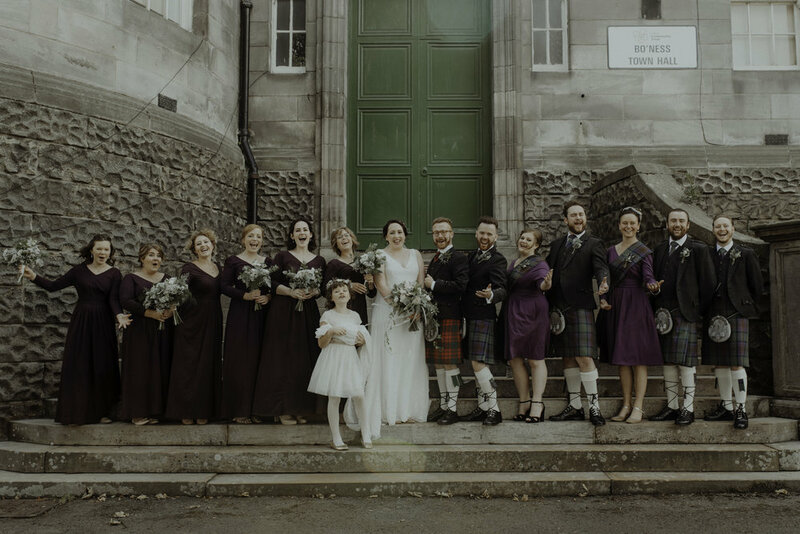 The bridal party’s flowers were from their local florist - Blooms Glasgow. Abi did not have a strong picture of what she wanted other than eucalyptus and blush garden roses. She sent in a few inspiration photos and left the artists to it. This proved to be the right decision, because the arrangements that they came up with were beautiful, unique, and personal. 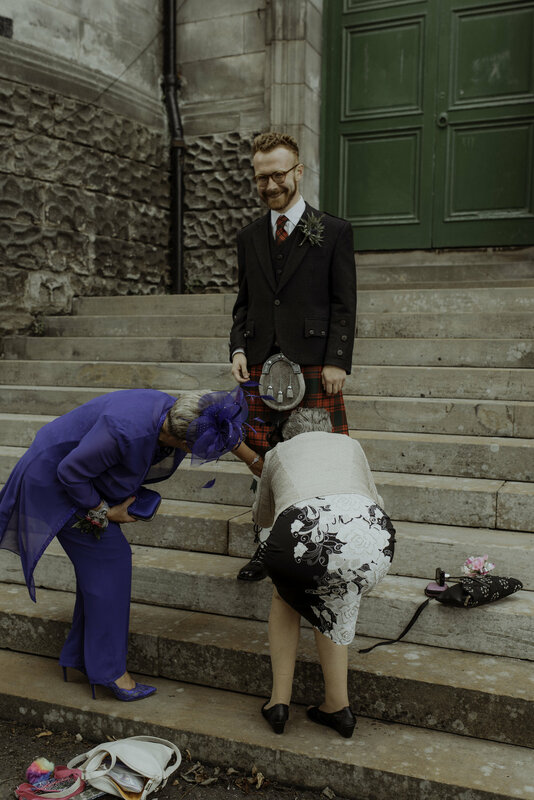 Abi and Ross felt that the thistle boutonnieres were a particularly thoughtful touch. 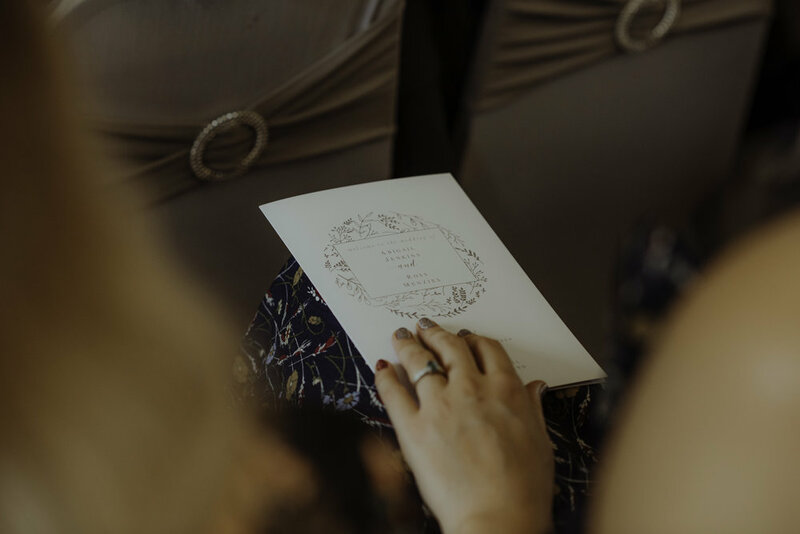 Abi agonized over the bridesmaids gifts and ended up choosing personalized “getting ready” robes from HollyRose Prints and delicate, handmade jewelry from Lux Lunae Designs. Abi worked with the artist, Page Masonson, to design the necklace and earring sets, which went on a gradient from a rose quartz color to a soft sage green. Page also made earrings for Abi, which she wore on the day. The gifts were a huge hit with the bridesmaids, but if she could do it again, Abi said she would keep it simple. 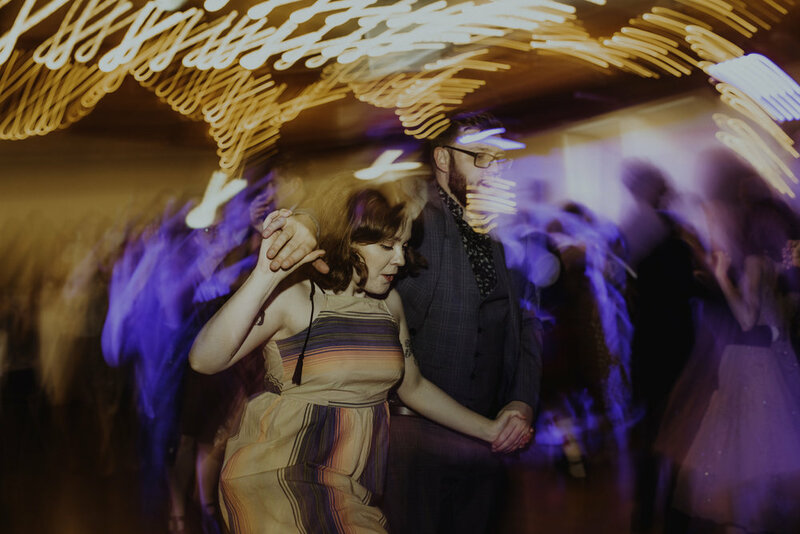 Abi and Ross found additional ways to add personalization through their wedding favors. They had scratch cards and soaps at the tables, and in the bar area they had matchbooks that Abi designed and bought from PerfectOccasionStore. They also had slippers, deodorants, body sprays, and makeup wipes in the women's bathrooms just in case any guests needed to freshen up. 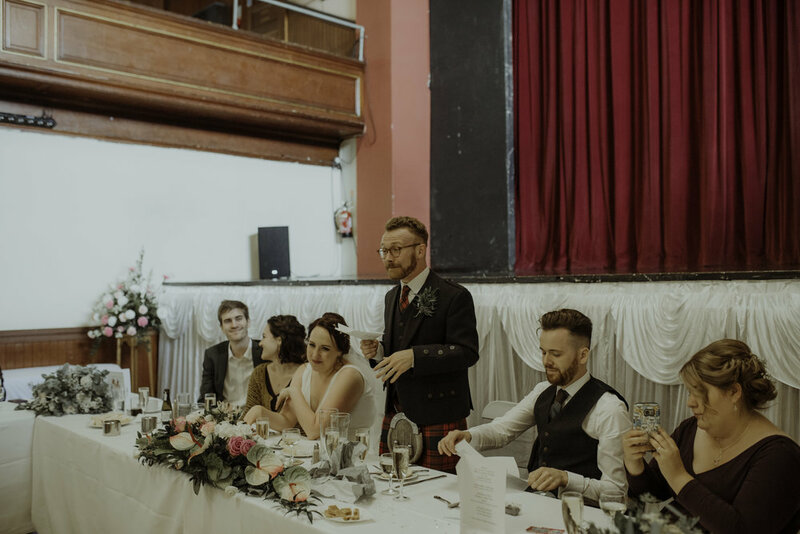 The Cèilidh band, HotScotch Cèilidh Band, that they hired played Scottish traditional dance music and served as their DJ, which saved money and meant Abi and Ross could have both Cèilidh and their dance music of choice - disco! This was very important to both Abi and Ross because they love a good party. 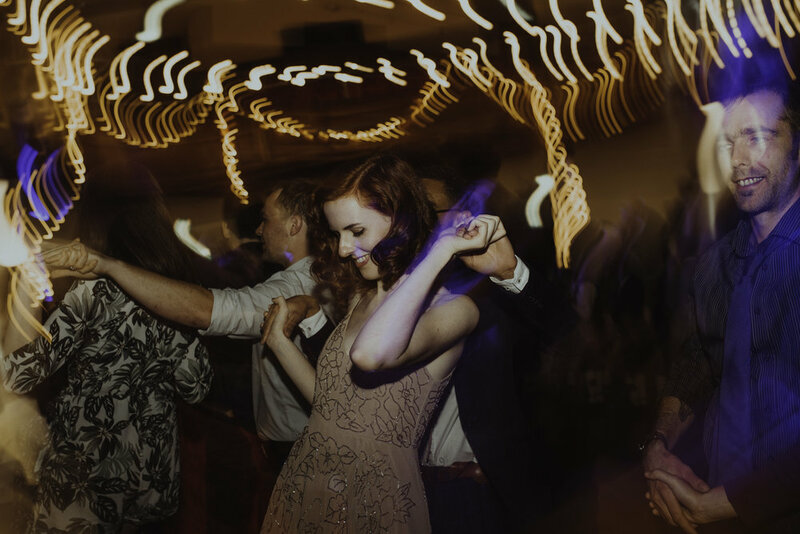 One of the most memorable parts of the reception toasting was the performance of a song from Abi’s Northwestern University Chi Omega sorority days. For Chi Omega women, it is traditional to sing the song, “Shades,” as a way to mark new life events. Abi’s co-Maid of Honor was a Chi Omega Sorority sister and she surprised Abi by arranging for the bridal party and the other Chi Omega sister present, to encircle the bride and sing it at the conclusion of the speeches. The entire reception party took it up with stomping and cheers. “It was beautiful,” said Abi. 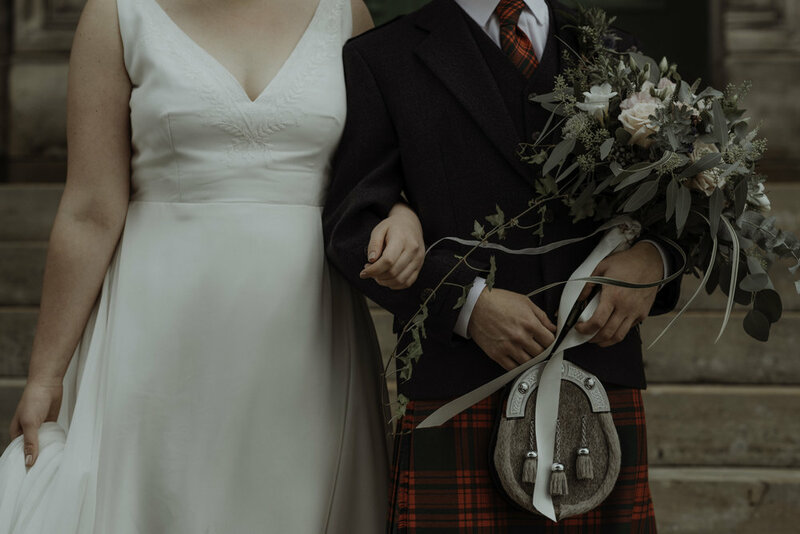 Abi found her dress at The Sentimentalist bridal boutique in Atlanta, Ga. It is wedding dress designer Rebecca Schoneveld's Zoe gown. The elegantly plunging V-neck is richly embellished with embroidery and beading, delicate flowers frame the neckline and the sweeping train of the skirt, which is made in ethereal poly Georgette. “I was so honored to wear clothes from a designer who actually designs sizes up to 30 and who features plus size models,” said Abi. 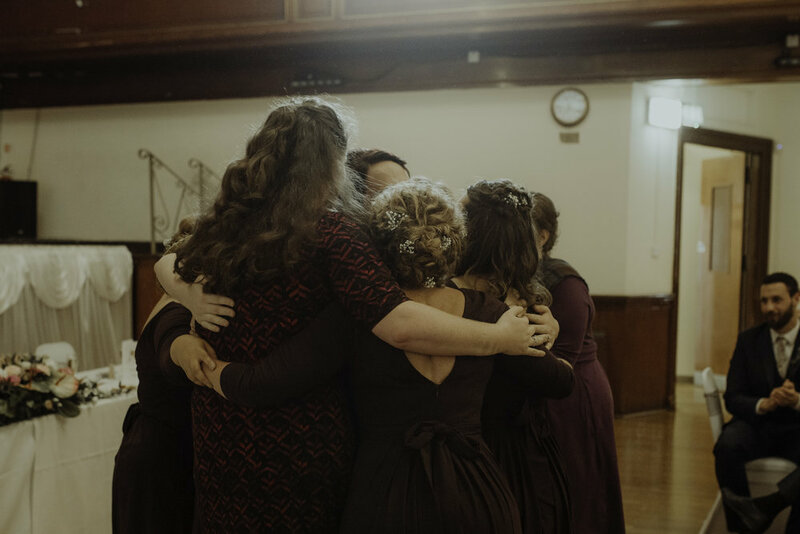 The bridesmaids wore simple plum dresses from eShakti, which Abi chose, because everyone could get their exact size and fit since these dresses are made-to-order. Abi’s 12-year-old niece and junior bridesmaid was even able to get a higher, more age-appropriate V neck. 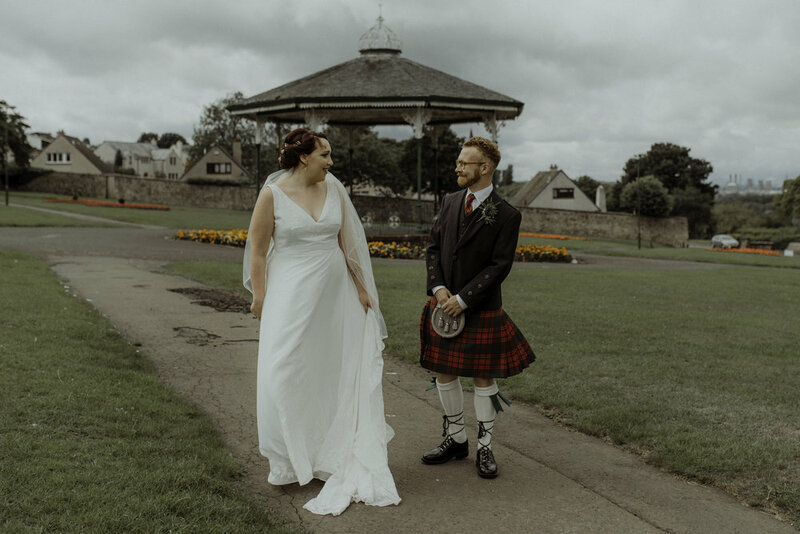 They were cost-effective as well and the neckline and pleating also echoed Abi’s dress for a little extra cohesion. 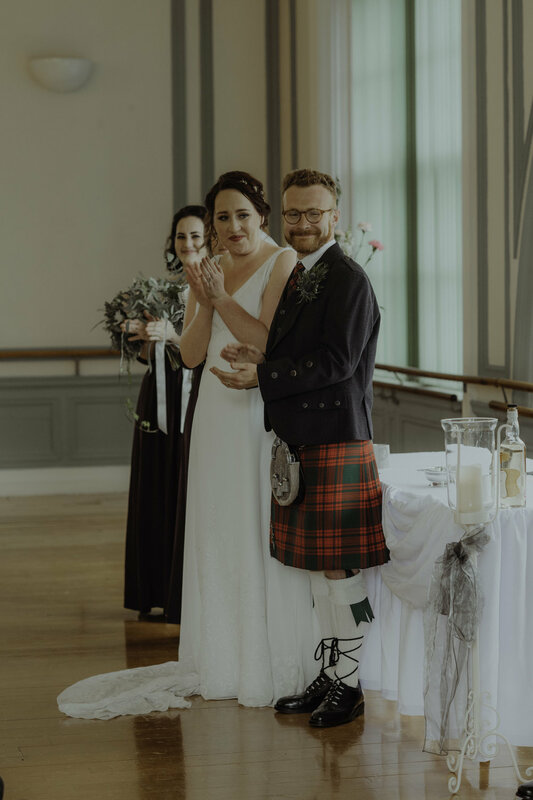 The groom's kilt is the formal Clan Menzies tartan. It originally belonged to Ross' late Uncle Jeffrey. 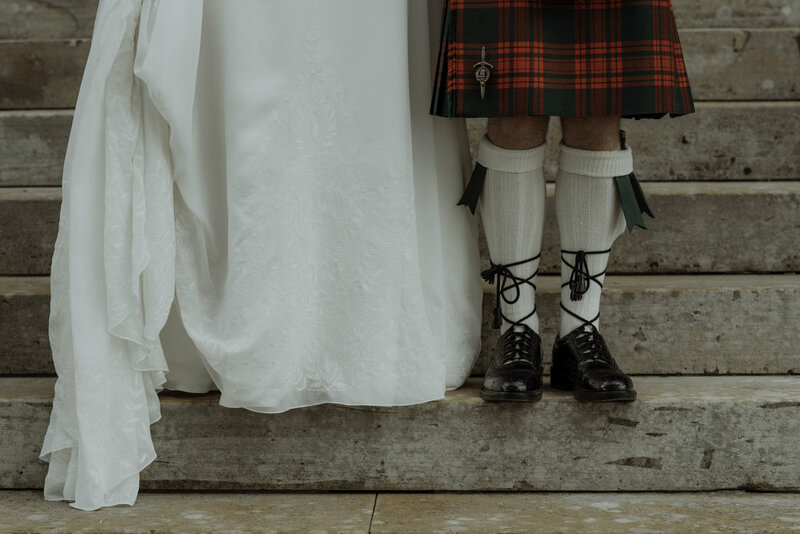 The groomsmen wore Isle of Skye tartan, which is not associated with a clan, to match the wedding colors. 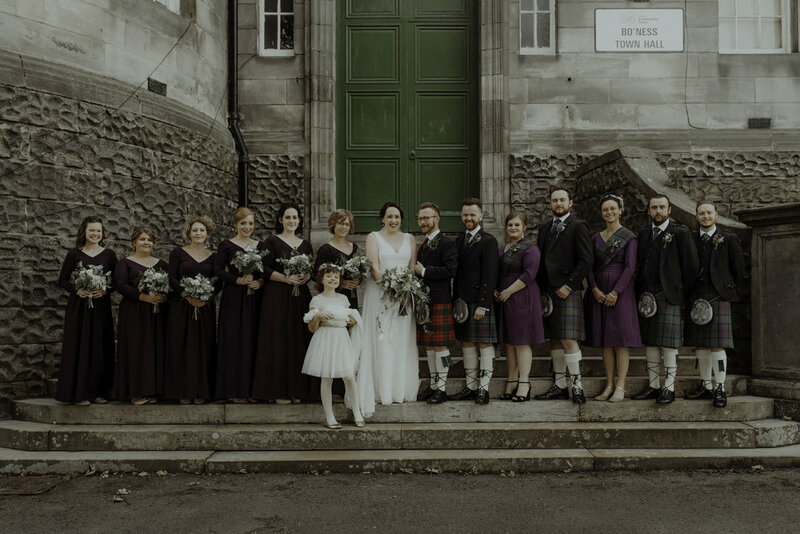 The groomswomen also wore eShakti dresses in the same style as the bridesmaids, but in a softer purple and shorter length to match the tartan. Abi has two favorite parts of the day. The first was hearing her husbands vows, which were so beautiful and heartfelt. He stole the show and there was not a dry eye in the house. The second was dancing to Runrig's Loch Lomond at the end of the night. 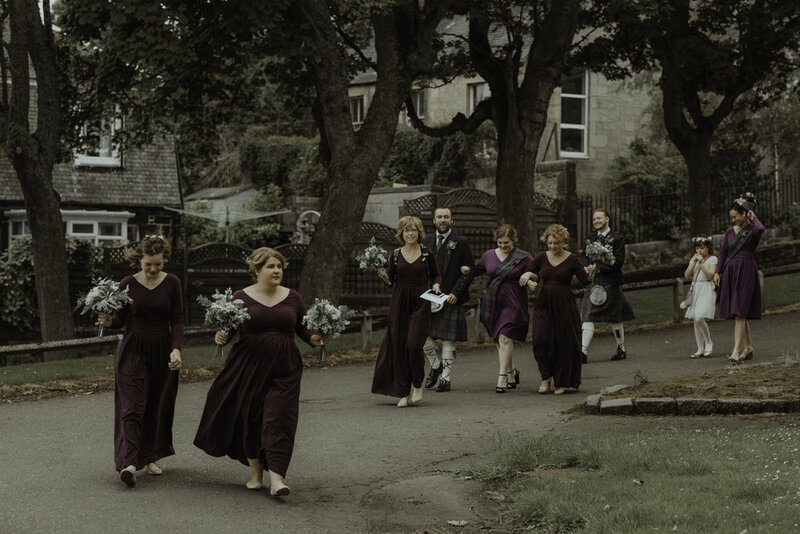 It is a classic final dance in Scotland, where you clasp hands, form a big circle, and run in and out until you're about ready to collapse. Ross' absolute favorite, apart from seeing his soon-to-be wife arriving into the hall, was making the rounds and talking briefly with almost every single person there. He is a social butterfly and not even his own wedding can stop him mingling. 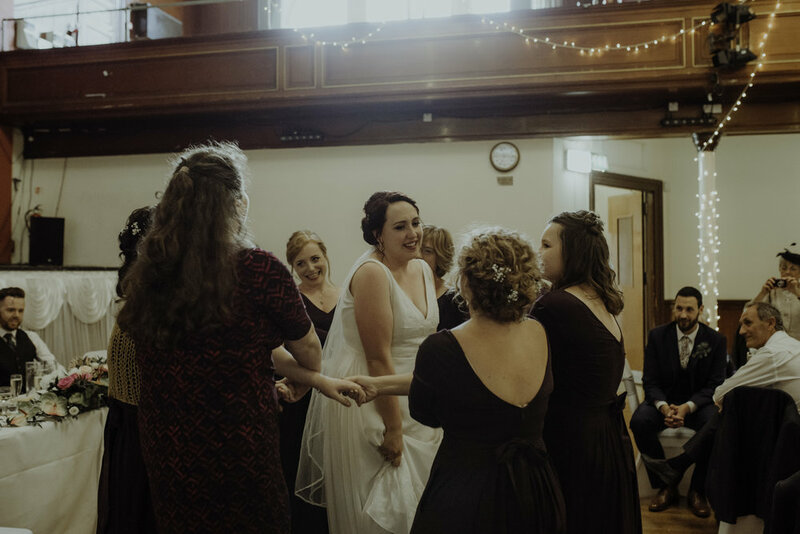 Abi’s biggest advice to other members of the Big Bride Club is to take help when it comes, even if it is not your first instinct, and not to stress about meeting every goal you have for your wedding. But most importantly, if someone questions your decision on something you know you like, say thank you and do it anyway!